Calling all you dessert lovers! I’ve got a beauty for you today. 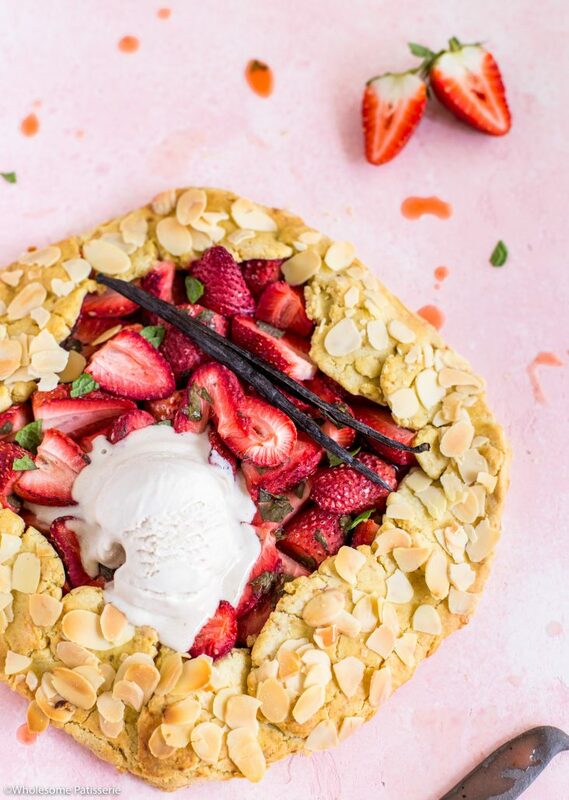 Strawberry, Mint and Almond Galette! Homemade simple and quick pastry paired with a gorgeous fresh strawberry and mint filling. 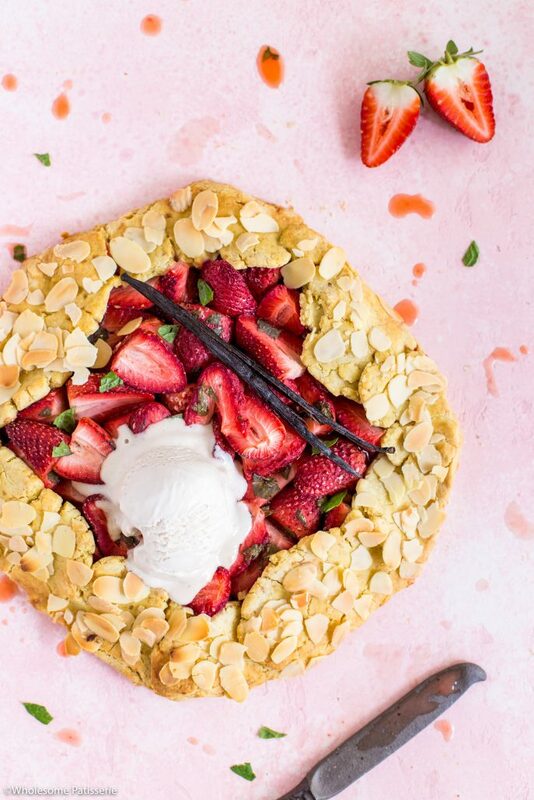 This galette is going to be perfect, really, for any day of the week, who doesn’t love a tasty sweet dessert after dinner? It can also be a showstopper when served on a special occasion. The rough pastry crust is sprinkled with flaked almonds for extra texture, to show-off the wonderful almond in the dough itself and of course more flavour. Seriously, almonds and strawberries are a fantastic duo, especially in dessert. 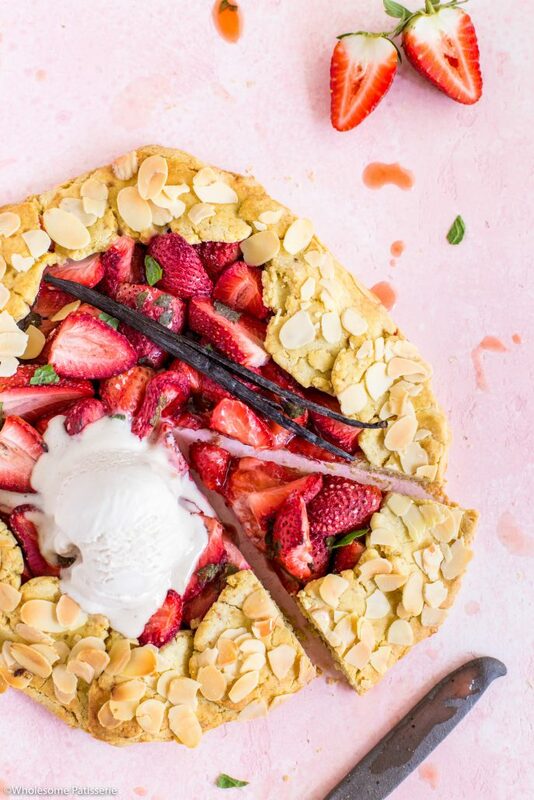 You can serve your warm, fresh out of the oven galette with a scoop or two of strawberry or vanilla ice-cream. The ice-cream is going to gently melt through the strawberry mint filling and you will be enjoying every mouthful. Enjoy! In a high speed food processor, add almond meal, flour, sugar, salt and chilled cubed butter. Pulse until mixture resembles a corse crumb. Add egg and pulse until well combined and mixture turns into a rough dough. Use your hands to stick it all together to form a soft dough. Form into a round of dough and wrap up in plastic/cling wrap. Refrigerate for 30 minutes. NOTE: you can chill dough overnight if needed. When ready to bake, preheat oven to 180°C (350°F). 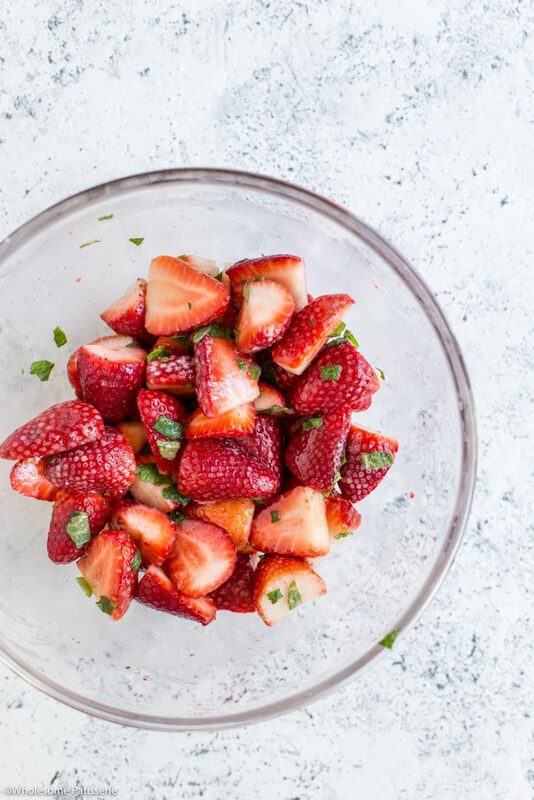 In a medium sized mixing bowl, combine halved strawberries, mint, maple syrup and vanilla, mix well. Add corn flour and mix until strawberries are well coated. On a lightly floured wooden board or bench, roll out dough into a 12” (inch) round. Gently transfer dough onto a large piece of parchment paper, big enough to line a baking tray. Place the strawberry filling in the middle of the dough, approx. 2” from the edge, allowing enough room to fold over the dough edges. Gently fold the sides of the dough up and over the outside of the berries. Creasing the dough together with your fingers as you go. Transfer galette with parchment paper onto a large baking tray. Using either the egg or milk, lightly brush the dough edges. Sprinkle over flaked almonds, lightly pressing them onto the dough so they stick. Bake for 30-35 minutes or until pastry is golden. Remove from oven and cool on pan for 10 minutes, then transfer to a wire rack to cool completely. Or serve warm straight from the oven! Enjoy with a scoop of ice-cream or cream! Store in an airtight container, refrigerated or in the pantry for 2-3 days. Hi, looks delicious! Allergic to almonds unfortunately, what can you substitute it with? Hi, I’m wondering if I can substitute butter with olive oil?